A Sequence of Sequins. 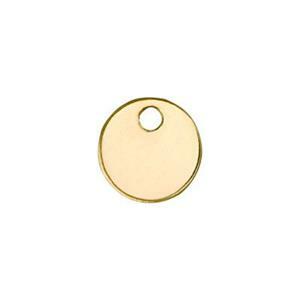 The GF46H – Yellow Gold Filled 6mm Round Disk Blanks with a .9mm Inside Diameter hole. Little round sequins – one just waiting to follow the other sequentially. Great wire wrapped to a chain necklace or chain earrings. This is a slightly thicker version of our standard GF46 lightweight blank. This 22ga version will take a cleaner stamping impression and feel more substantial. Ordered a bunch of these tags for stamped necklaces and loved them. Great quality. That being said, I don't have great letter stamps, so I had trouble getting the letter to stamp well. Probably will order a softer tag next time.